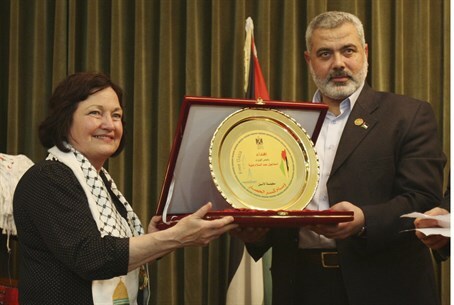 Egypt detains and deports Nobel Laureate and anti-Israel activist Mairead Maguire, who tried to enter Gaza through Rafiah. Egypt on Wednesday detained and deported Northern Irish Nobel Laureate and anti-Israel activist Mairead Maguire and held up others who had been planning to go to neighboring Gaza, AFP reported. Maguire had intended to join a delegation of women activists going to Gaza, activists and officials told the news agency. On Tuesday, airport police had already detained and deported American activist Medea Benjamin, also part of the delegation, who told AFP police broke her arm. Maguire said she arrived at Cairo airport on Tuesday night with fellow activist Ann Patterson. "We were taken to the detention center and questioned and held for eight hours, and were told we would not be allowed entry into Cairo and would be put on a plane," she told AFP by telephone from Britain after her expulsion. She said police were polite but gave no reason for barring her, while an airport official told AFP she had been blacklisted. Maguire, born in 1944, won the 1976 Nobel Peace Prize with Betty Williams for founding a peace group to resolve the conflict in Northern Ireland. This is not the first time she has tried to enter Gaza and failed. In 2010, Maguire took part in the flotilla that aimed to break Israel’s naval blockade of Gaza. Following the flotilla, Maguire was expelled from Israel for 10 years. She appealed the decision to the Supreme Court, but the appeal was rejected. She was subsequently deported from Israel. The delegation of activists that will try to enter Gaza through the Egyptian Rafiah border crossing was meant to be led by Djamila Bouhired, an icon of the Algerian war of independence from France, reported AFP. Bouhired had been expected to arrive on a flight from Paris, but did not do so. Egypt controls the only border crossing with Gaza that bypasses Israel, and is accused of colluding with the Jewish state to blockade the territory ruled by the Hamas terrorist group. While the government of former Islamist president Mohammed Morsi was friendly with Hamas, the military-led government that ousted him has cracked down on the group, which it accuses of a December attack on Egyptian police headquarters, and of planning church bombings in Sinai last Christmas. On Tuesday, in the latest step in Egypt’s crackdown on Hamas, a court outlawed the terror group and ordered all of its assets seized. "I think it's sad, what they've done," Maguire told AFP of the reception she and the other activists received in Egypt. "It is an example and confirmation of the Egyptian government's compliance with the blockade of Gaza," she charged. Wednesday was not the first time that foreign activists have been prevented from entering Gaza through Egypt. In 2010, The British pro-Hamas Viva Palestina organization, headed by anti-Israel British MP George Galloway, tried to lead a convoy of some 150 trucks with aid to Gaza through Egypt. Egypt blocked the effort, insisting instead that aid to Gaza should be sent through recognized international channels. Galloway’s group tried a second time in 2011 and again in 2012, but Egypt again refused the convoy to enter Gaza.